Terrific year for the Hopelink food drive. Thank you all for your contributions to our Pick-a-Pound for Hopelink. You donated $112.05 in cash (the small plastic container in the photo). Your generosity sure adds up! 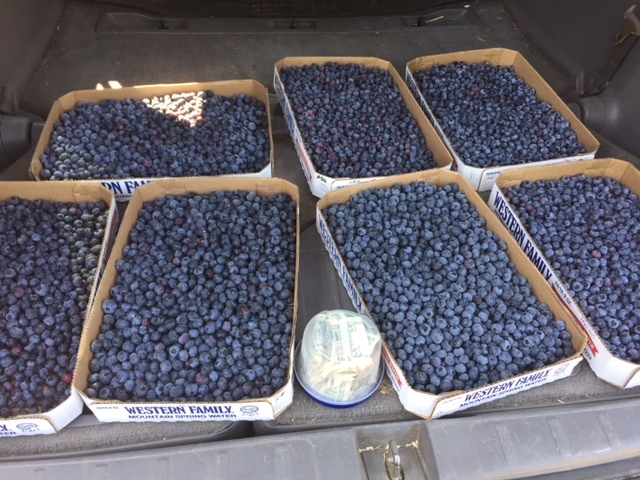 And, I delivered over 30 pounds of blueberries to the Hopelink food bank in Carnation on Monday. Volunteers from Hopelink picked 13 pounds Sunday morning, for a total of 43 pounds of berries. That's a lot of berries! Thank you all! Our sunflower garden opens today. You can cut your own flowers for .50 cents a blossom. We have many colors. I'll post pictures tomorrow, or come and see yourself. I think this is going to be terrific picking week. If you have been waiting for the Stanleys, you can come and pick. The big berries are here. Eberharts, Dixis are all on with easy picking. If you love the sweet berries, Jerseys and Pembertons are available with Jerseys being the easier picking.